We recently featured a story about a Rihanna fan altering a Rihanna picture to make her look white claiming she looked better even though white people spend billions each year on tanning products to look darker and even more on surgery for fatter lips and fatter butts. MUA @paintdatface recently posted a photo of a makeup look transforming a white woman into a black one. 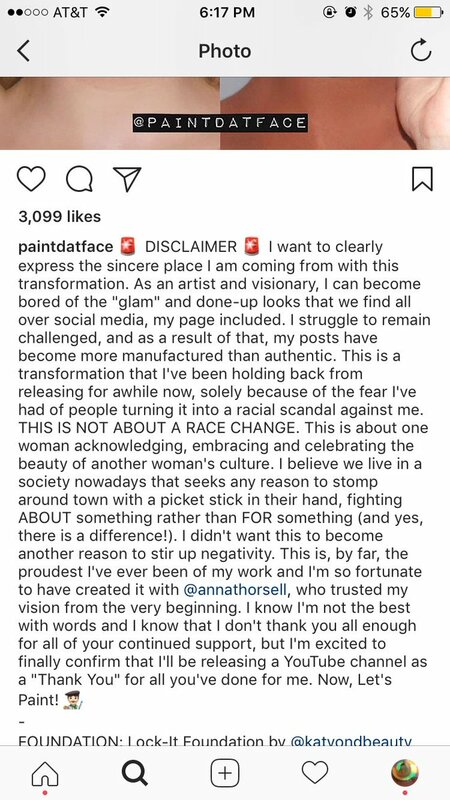 Clearly anticipating a backlash, the makeup artist posted a ‘disclaimer’, which stated that it wasn’t about ‘a race change’, but rather was ‘about one woman acknowledging, embracing and celebrating the beauty of another woman’s culture’. And after that, the Instagram account went private.